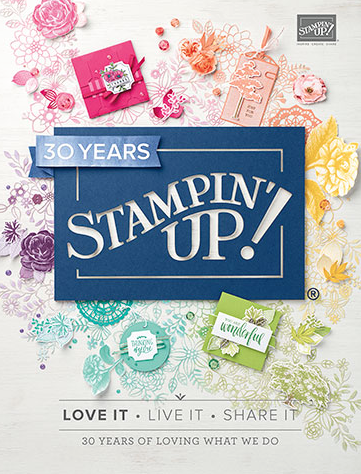 I have just returned from OnStage in San Antonio - it was my most favorite Stampin' Up! OnStage Event ever! As a gift for my team I gave them each a stamp to use in their new catalog that says 'I own this' to mark off what they already have in the catalog...which I’m sure they will never use since we NEVER order something we already own right? Everyone loved it so much I have decided to give away some of these stamps to customers. * Your order must be $50 or more-before shipping and tax and you must use the hostess code. Your free stamp will be mailed directly to you within 5 business days. Welcome to the Creatin' With Kirsteen stop on the February Stampin Friends Blog Hop! This month the theme is Thanks! You can navigate back to Katja's blog or forwards to Pia's blog by clicking on the previous or next name at the bottom of this post (you are currently at Number 2). I have to admit when I saw this months theme was 'Thanks' I thought it was a bitty weird - we usually do 'Thanks' in October or November...but then I got to looking at some stamp sets and realised it would be nice to make some Spring coloured Thanks cards rather than Fall looking ones! So, my card has butterflies - something I always consider spring-like even though here in Houston butterflies tend to emerge more in early fall - we just don't have 'Spring' here!! ​These Thanks-a-lot cookies are perfect for this theme!!! I hope you liked my projects....'Thanks' for stopping by. Click on the next name in the list to hop on for more ideas! Welcome to the February 2019 Kre8tors Blog Hop! If you have hopped on over from Sandra's Blog - thanks for hopping along! This month's theme is Love or Valentine's. I had created an easy replicable 'LOVE' card for a swap some time ago - but the Postal Service didn't deliver them on time to be swapped so they were all returned to me - which has turned out as a good thing because I can use them all for the Residents at Magnolia Evergreen Cottage where I now work. The Residents of the Assisted Living/Memory Care cottage that I am Manager at have made little Valentines mail boxes and those are waiting to be filled....so if you would like to send anything (cards or treat boxes) to help me fill them - the address is Kirsteen Gill ED, Magnolia Evergreen Cottage, 21605 Provincial Blvd, Katy TX 77450. It would mean SO MUCH to these residents and would brighten their day! Welcome to the Creatin' With Kirsteen stop on the November Stampin Friends Blog Hop! This month we are highlighting Happy Holidays! Weren't Anastasia''s projects awesome? You can navigate back to her blog, or forward to Pia's...by clicking on the previous or next name at the bottom of this post (you are currently at #1). Christmas is always a Holiday that makes me happy and recently the little elves in the Signs of Santa bundle make me just want to wrap presents, get the tree decorated and cook a turkey! When I purchased the Santa's Workshop Memories and More Card Pack I really thought it would be like most of the card packs I've purchased and sit in my stash untouched - but I took it with me to retreat and made LOADS of cards with it using 2 of the packs of Santa's Workshop Cards and Envelopes. To make those little curly tip boots I used heart framelits cutting a smaller one out of a larger one, then trimmed the smaller top piece off (that gives the sole of the shoe) and then cut 2 of the ghost framelit from the cauldron bubble bundle...and trimmed the 'head' off the ghost and used the 'tails' as the trims for the boots. I hope you liked my projects....Thanks for stopping by. Click on #2 to hop on for more Happy Holiday ideas! Welcome to the November's Kre8tors Blog Hop! If you have hopped on over from Sandra's Blog - welcome! This month's theme is Birthday...we need plenty of Birthday Card ideas don't we? And - It's Melissa's birthday TODAY too - so Happy Birthday Melissa!! ​As I type this I am preparing to head off to Orlando to the Stampin' Up! OnStage event. When this post goes live I will be traveling back to Houston and then heading off to a wedding - so I have had to schedule my post - lets hope things go to plan! Stampin' Up! are celebrating a big Birthday this year - the company is 30 years old and for OnStage we were asked to make Celebration Cards as swaps - so I went back into the main Annual Catalog and used a stamp set and Framelits that I hadn't used before. The Sea of Textures Stamp Set and Under The Sea Framelits. I made a shaker card that is also a pop-up gift card holder. Thanks for stopping by - I hope you get lots of Birthday inspiration on this hop! Now hop on over to Jan's Blog by clicking on the next arrow or on her name below to see what she has created. Welcome to the Creatin' With Kirsteen stop on the September Stampin Friends Blog Hop! This month we are highlighting Halloween themed projects. Weren't Sandra's projects awesome? You can navigate back to her blog, or forward to Katja's...by clicking on the previous or next name at the bottom of this post (you are at #1). I can't believe that we are looking at Halloween projects already! This year has flown by and it's still 95F here in Houston! Do you remember these treat boxes I created a few years ago? I decided to revisit them (since yet again my mojo has walked) and use them as inspiration for todays projects. When I made the green treat box in the Holiday Catalog for out KILTS Team meeting my great friend Leslie mentioned it would be cute as a 'Frankie'. So, with her permission I ran with that idea, taking inspiration from the pillow boxes and I have to admit he's so darn cute! Thank you for the idea Leslie! There is a list of what I used for this project at the bottom of this post, but to make this treat box I cut one full box from the Takeout Thinlet Dies in Granny Apple Green and trimmed the top tabs off. Then I cut another box in Black and using scissors I cut a jagged edge around the top making sure I was always about 1/4" from the top. I then ran a thin line of adhesive around the top of the 'hair' that I had created and glued the black 'top' to the Granny Apple Green 'box base'. I then punched a couple of circles in white and black and added those for eyes, punched another in Granny Apple Green and sponged the edge then adhered that with a Stampin' Dimensional. I added the mouth freehand with a Grey Marker. Can you tell how I made the 'bolts'? Believe it or not - those are pieces from the Christmas Bulb punch!! I punched 2 for each side, rolled up a glue dot between two of them to create a little dimension then glued them on with multipurpose adhesive. I used the 'mummy' from the pillow boxes as inspiration for my card - it's basic but I think cute - and EASY to replicate! Tear strips of Very Vanilla and sponge the edges with Sahara Sand then glue one layer over another. Punch 2 circles in White, 2 in Vanilla and 2 in Black. Tear the Vanilla ones in half and sponge then glue on top of one another. I hope you liked my projects....Thanks for stopping by. Click on #2 to hop on for more Holloween ideas! Welcome to the September's Kre8tors Blog Hop! If you have hopped on over from Sue's Blog - welcome! This month's theme is Sympathy. Unfortunately, this is something everyone can relate to. Creating a Sympathy card can be difficult, it's hard to be creative in the midst of mourning, or to know how to create for someone else who is hurting. Hopefully this hop will give you some ideas, making the process easier for some. I love the simple elegance of this new stamp set - Wishing You Well. I wanted to use the wreath and do the baby wipe technique - but my re-inkers are packed away somewhere - so I stamped the image then added some extra colors with markers. Hop on over to the next stop on the hop - Su's Blog by clicking on Next.